PURPLE•K® has become a staple in any serious bodybuilder’s supplement program, because it gives you the real strength gains you need to move big weight. With each workout, you’ll feel your strength grow. 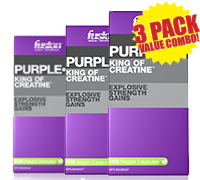 Other creatines just can’t live up to PURPLE•K – they are poorly bioavailable and cannot even deliver a full and concentrated dose of creatine to your muscles. Because PURPLE•K is “pH-correct,” there is no loading, bloating or water retention, and your body will absorb 100% of the dose.